Wednesday we awoke to snow. At times it was driving side ways and clouded our view and other times the flakes hung suspended in the air, holding their breaths as they fell to the earth. And it was cold. But we were signed up for an hour of prayer at Cathedral to pray for the protection of the unborn so we bundled and hustled and stamped and shushed our way out of the house, through the parking lot, and into the chapel. It wasn’t until we were all squeezed into the pew and had peeled off our coats that I had the fleeting thought that this hour over lunchtime might not have been the best idea. 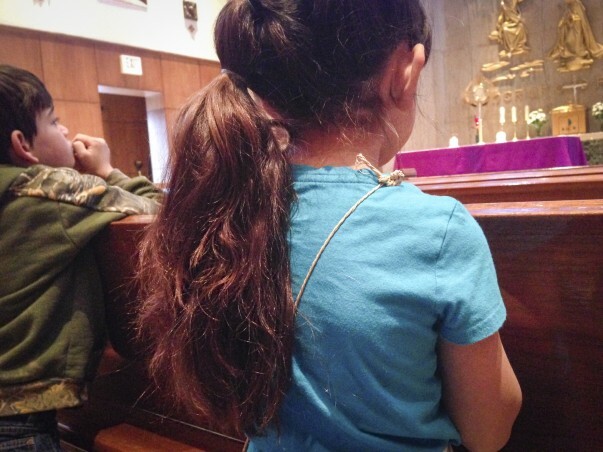 Lulu woke up hungry, the rosaries were clanking and clattering, Gemma decided she didn’t WANT to be quiet, and I heard Ellie praying the meal blessing prayer. “Ugh. Lord! I am so sorry.” I rolled my eyes and gritted my teeth internally. I resolved to white knuckle it through the next 60 minutes the best that I could and just offer it up. What had I been thinking, anyway? Then I heard Ellie say the meal blessing again. Here we were, praying for the protection of the unborn and for mother’s to choose life and I was at wits end with my children. Oh, the irony. These gifts, MY gifts were those little fingers on noisy beads, eager, enthusiastic voices and misplaced prayers from rosy lips. I was less than receptive to that bounty and I was embarrassed when I recognized it. I looked with new eyes on the orderly chaos all around me and murmured thankful praises for the gentle reminder. 41 years. 55 million lives aborted. Pray for the protection of the unborn.
. . . .it was the most powerful hour of prayer. We had CHILDREN praying at that time. We had a busy TODDLER wiggling. We had a beautiful BABY expressing herself. Not you. W E . And WE needed that. It was at that very moment that the rest of us had our hearts pierced. Yes, we were there with Jesus, praying for forgiveness, praying for an end to the slaughter, praying for CHILDREN. OUR CHILDREN. Praying for conversion, OUR CONVERSION. We needed your children there. Thank you for bringing them. Thank you for being a beacon of hope and an example of a family who welcomes new life. God has blessed you with this beautiful family, and He has blessed our community with your beautiful family. We are so thankful to God for YOU! Years ago, Father Scherer led a Day of Recollection at Blessed Sacrament parish. We opened the day with the meal prayer. He taught us that this is an appropriate prayer for any time, because we are always about to receive gifts from the Father. So true! well said Charlie’s mom. You bring tears to my eyes as I agree whole heartedly!